Title: Vegetation near Santa Teresinha, NE Mato Grosso. Title: New pteridophyte records for the territory of Amapá, Brazil. Title: The effect of deforrestation on the water cycle in the amazon basin: an attempt reformulate the problem. 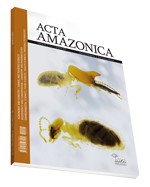 Authors: GAT, J.R.; MATSUI, E.; SALATI, E.
Title: Uma contribuição à climatologia da dinâmica da troposfera sobre a Amazônia. Authors: KOUSKY, V.E. ; MOLION, L.C. Title: Atividade antibacteriana e antifungica de espécies de Gnetum. Authors: GIESBRECHT, Astréa M.; PURCHIO, Adhemar; UJIKAMA, Keidi; RIBEIRO, Maria N.S. Title: Bacia 3 –Inventário Florestal Comercial. Authors: HIGUCHI, Niro; JARDIM, Fernando, C.S. ; SANTOS, Joaquim dos; BARBOSA, Antenor Pereira; WOOD, Thomas W.W. Title: Essência papeleiras de reflorestamento:8 madeiras nativas da Amazônia. Authors: CORRÊA, Antonio de Azevedo. Title: Protótipo de um cata-água que gera 1 kw de eletricidade. Title: Neuroptera of the Amazon basin. Part II. Introduction and chrysopini. Authors: ADAMS, Phillip A; PENNY, Norman D.
Title: Material Zoologico depositado nas coloções sistemáticas de entomologia do INPA, resultante do Projeto INPA/MAX- PLANK (Conv ênio CNPq/MPG). Authors: ADIS,Joachim; JUNK, Wolfgang J.; PENNY, Norman D.
Title: Livros: Energia:Bibliografia Seletiva 1983 (Comissão Nacional de Energia Nuclear, Rio de Janeiro 1984). Title: The Grasses of Bahia. Title: Diet and Feeding Behavior.